Using Yamaha RD-V controllers with a 3-axis FXYX cartesian robot, 3D printing motion can be controlled with other third party motion controllers such as a Trios Motion MC403/MC405 controllers shown here using an open source GCode interface called Slic3r and Trio's Motion Perfect GCode interpreter. The MC405X was used as a step and direction integration to drive the Yamaha RD-V controllers. 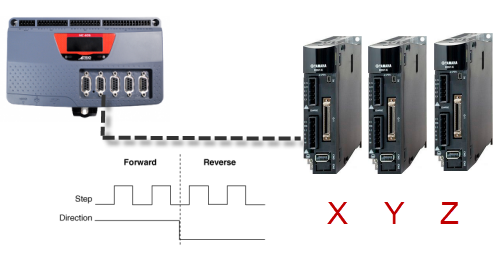 Also provided in the sample code is an MC403X sample providing step and direction to 3 Yamaha TS-SD controllers using low cost Transervo robots.